My latest piece in the series I am writing for SFist was published yesterday. 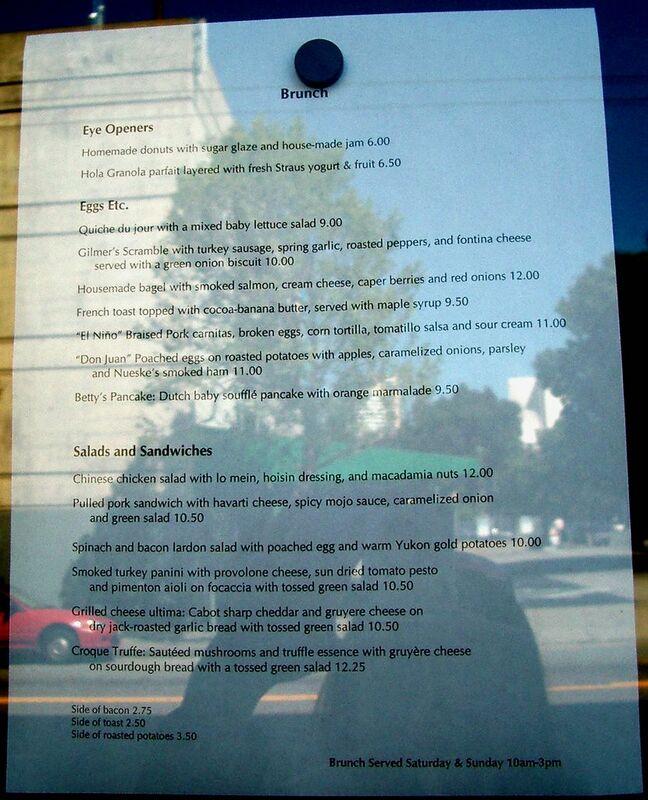 I am eating my way around the city in alphabetical order. This week it was the turn of the letter C.
Even I can suffer from food fatigue from time to time and begin to tire of trying and writing about too many new restaurants. So when looking for somewhere to review beginning with a C, I decided to return to a place I loved on our last visit, hoping to replicate the good experience a second time. San Franciscans hurtling down Gough, foot pressed hard on the pedal, hoping to sail through as many green lights as allowed, and more, often lose the traffic-light-fairy at Grove Street where they are forced to come to a halt. Red. Stop. Glance to the left. Citizen Cake. Our early arrival, just after midday, meant that there were plenty of seats available and that the brunch menu was still being served. We ordered freshly squeezed grapefruit juice (too cold - it had been refrigerated and therefore wasn't quite as recently extracted from the fuit as we had hoped) and perused the menu. We were bought a complimentary plate of various breads to share, with a pat of butter and a little bowl of the most beautiful looking, vibrant orange marmalade. Made in-house the preserve, fresher tasting, more fleshy, naturally sweeter and less bitter than most citrus confitures was delightful, addictive and quite irresistable. We were quickly hooked on it. We asked our waitress if we could, perhaps, buy some to take away. Unfortunately, they were at the end of the batch. She told us they do sell it sometimes, but that it wouldn't be for a while because they were just about to switch to Meyer lemon. If they do the same wondrous things with lemons as they do with oranges, this soon-to-be change should not be too much of a disappointment. My lunch companion was having trouble deciding between the Croque Truffe flaunting mushrooms, gruyere and truffle as temptation or the quiche of the day, in-season asparagus. The waitress described the Croque as "heavy and rich", the quiche as "petite". Having devoured what seemed like half a loaf of bread and marmalade already, my friend plumped for the lighter option, the quiche. Indeed it was tiny, served with a bright, superbly dressed green salad. The eggy tart was light, delicate and very pretty with its thin slice of lemon baked into the surface. Scrumptious. I ordered the delicious-sounding Braised Pork carnitas with broken egg, corn tortilla, tomatilla salsa and sour cream. It turned out to be the bum choice on the menu. The fact that this choice was such a huge portion, made it even more of a disappointment. It was bland and tasteless. The lack of salt or pepper on our or any other table in the restaurant, left us without a way to sprinkle a little more flavour on to it. The salsa, which I expected to give the rest of the ingredients a spicy kick up the backside, had no piquancy whatsoever. Hey - give me some chili, please. The pork itself was the only admirable element. We totally agree with they guy on the table next to us who we overheard declare "try the pork, it's the best thing on the plate". So I made a bad choice. My fault. Next time I want quasi Mexican food I shouldn't look for it at Citizen Cake. It's not like this town is lacking in good food influenced by our friends South of the border. I'd almost die for the brunch plates at Cocina Primavera, for example. If I had chosen the Croque Truffe, like I did last time, I would probably have been in brunch-time heaven, even if it would have meant untightening the belt a little or going without further food for the rest of the day. As regular readers might remember, one of my favourite addictions is Citizen Cake's incomparable Lemon Cookie. We made sure we picked up a couple from the adjoining bakery before it was time to leave. Any guesses as to how many hours we lasted before our willpower caved in and those cookies were gonners..? In the 2005 James Beard Foundation Awards announced today, Citizen Cake's Elizabeth Falkner has been nominated for the Outstanding Pastry Chef Award. You go girl! Citizen Cake has been one of my faves for years. I just went there a few months ago to celebrate a friend's birthday. Glad to hear about the James Beard award. 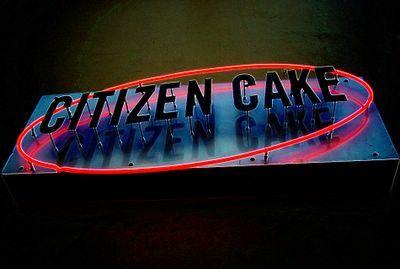 I tried to make it to Citizen Cake on my last trip to SF but I ran out of time! (I did fill up on Brioche at Tartine though). Thanks for the review. I'll have to give those lemon cookies a try next time I'm in town. Hi, the Chef here At Citizen Cake. You know, the first time I put the pork carnitas on the brunch menu every body went bonkers over them. Recently, just before your review, and probably just after you ate them, I discovered they needed some help. I have addressed this problem since. I would like for you to come in again and introduce yourself and see the improvement. I am working weekends on the day job right now, but as soon as I have some free time I would be delighted to take you up on your offer. Thank you for writing.